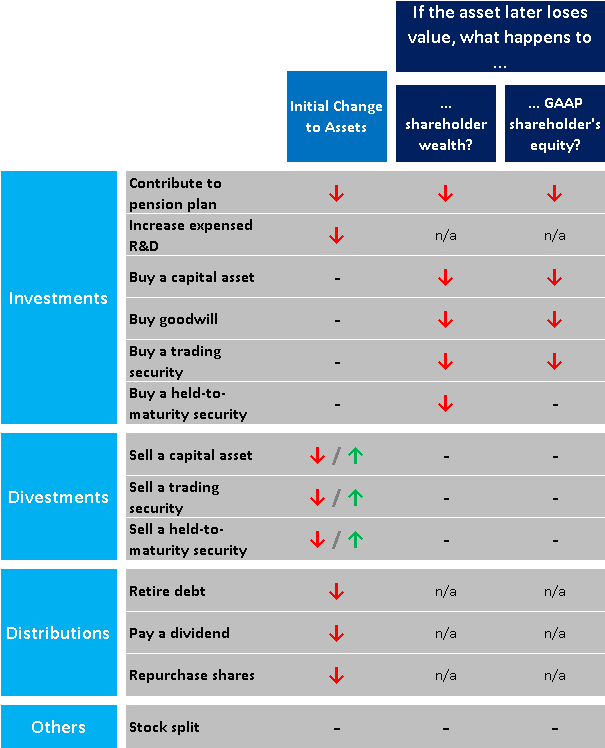 You are Here: QCF » Cookbook » Capital Allocation » What Does a Share Buyback .. Buy? But the word buy in share buyback can be confusing. The following chart summarizes common capital allocation options available to the typical corporate. Each row in the chart specifies a change in capital allocation for the firm. The first column, Initial Change to Assets, demonstrates the accounting impact. The second and third columns demonstrate what happens to shareholder economic wealth and accounting equity should the subject asset later fall in value. We’ve assumed in this chart that assets are purchased at fair market value; when sold, the firm may realize a gain or loss. Buying something means exchanging cash for an asset. If that asset goes up or down in value, then the firm’s value similarly rises or falls. A share buyback doesn’t buy anything. Just as retiring debt extinguishes lender claims, retiring shares extinguishes shareholder claims. The affected securities vanish. As they no long exist, the assets affected by the transaction can subsequently neither rise nor fall in price. A dividend payment is equivalent to the combination of (a) a share repurchase plus (b) a stock split (to restore the share count to its original value). The chart entries for these trades reflects this equivalence. Myth: Buying back “overpriced” shares destroys shareholder value. Reality: From the investor perspective, a buyback results in his trading shares for cash. If the surviving shares fall in value, the investor who participated in the repurchase realizes less value destruction. A variation of this myth focuses on changes to EPS. For the salient EPS changes to be valuable, one must argue that a stock split changes shareholder wealth. This is challenging. Myth: A company can create value by timing its equity repurchases. Reality: surplus cash on the balance sheet earns LIBOR while incurring an opportunity cost somewhere between WACC and the cost of equity. If timing a share repurchase leads to delaying a share repurchase, investors suffer immediately. Is a Share Buyback More Like CAPEX or a Dividend Payment? We find that nothing is bought in a share “buyback” or “repurchase”, and in fact buybacks behave nothing like a capital expenditure or other sort of purchase. The notion that share repurchases succeed or fail based on subsequent share price movements, or that delaying share repurchases can enhance shareholder value, is identical to the argument that delaying dividend payments can enhance shareholder value. We find this reasoning uncompelling.